How many amazing themes can you pack into one picture book? 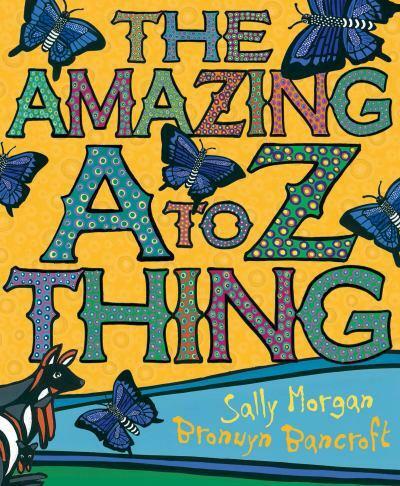 The answer is lots and Sally Morgan and Bronwyn Bancroft’s new book, The Amazing A to Z Thing, proves just that. It’s hard to know where to begin describing this exquisite story. At face value, it’s a stunning Australian alphabet book, highlighting all sorts of this country’s unique wildlife from anteaters and bilbys to galahs, quokkas and yabbies. 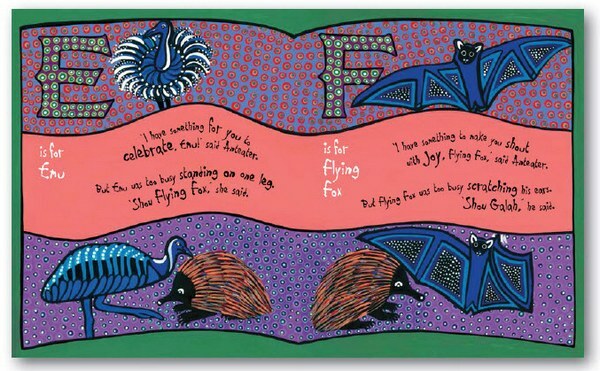 Aboriginal artist Bronwyn Bancroft has created beautiful, intriguing illustrations of each creature and every page is filled with colour and detail. Then comes Morgan’s delightful story, about a little anteater who has something to show her friends. 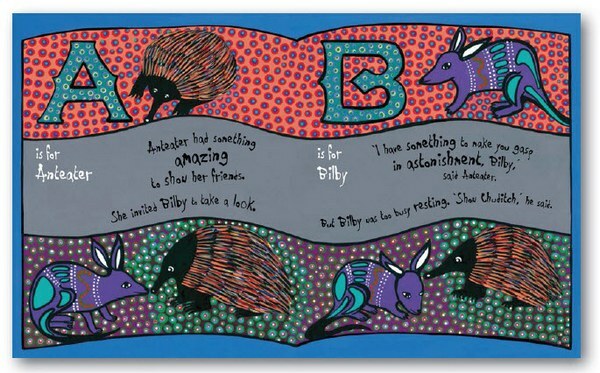 Anteater invites Bilby to have a look at her amazing treasure, telling him that she has something that will make him “…gasp in astonishment…” however Bilby is too busy resting and suggests she shows Chuditch. “I have something to make you squeal with happiness, Chuditch.” said Anteater. But Chuditch is also too busy and suggests she shows Dingo. And so the story continues with Anteater visiting all the animals of the alphabet and each time, appealing to them with the promise of happiness, enchantment, joyfulness and more. It quickly becomes apparent that Anteater is quite the little salesperson, assuring the other animals that giggles and excitement are there to be had, if only they’d look at her amazing thing. Sadly, the animals are all too busy, leaving Anteater to enjoy her treasure on her own, with a surprisingly happy result. As a book lover, I found the punchline of this story just superb. The combination of beautiful artwork, Australian themes, a clever twist on a cumulative story told in the tradition of The Little Red Hen, and exposure to a huge range of emotions makes this book simply amazing. Find The Amazing A to Z Thing online at Fishpond.